Rainer Werner Fassbinder opens his monumental 16-hour miniseries (13 parts and an epilogue) Berlin Alexanderplatz, based on the eponymous novel by Alfred Döblin, with the protagonist Franz Biberkopf (Günter Lamprecht) leaving Tegel prison after a four-year sentence for killing his prostitute girlfriend Ida (Barbara Valentin). Franz hesitates; in just four years he has become fearful of the outside world. Berlin of 1928, with its engine noises and car horns, the constant bustle of street and sidewalk traffic, the endless parade of people in endless pursuit of seemingly nothing, the cries of the street vendors, the whistles of the policemen, the machinations of the petty thieves—all of this frightens and repulses Franz, who has no confidence in his ability to maintain a life outside the prison walls. A guard attempts to reassure him and sends him out into Berlin but Franz knows the world is a trap. Prison was a trap too, of course, but it was more straightforward in its approach to captivity. Everything was ordered and each activity had its circumscribed allotment of time during the day. Someone was there to be sure you were where you were supposed to be. The world is too open and leaves one unsheltered. Franz avoids open spaces; he clings to walls as he makes his way among the buildings. He randomly bursts into ridiculous song with an abrasive baritone, perhaps in an attempt to fill the empty spaces with sound, or to drown out the tumult of sensory information and unbidden thought. Franz appears unhinged and finds himself huddled on the floor of a stranger he just met, who contrives to tell him a story about some quixotic figure. As the stranger continues his rambling tale, he too seems unhinged. This establishes something of a reiterated pattern that will continue throughout the miniseries: Franz bumbles his way into some situation where it would seem that he is on the edge of insanity while his interlocutor is relatively stable (perhaps guileless or guileful, depending on the specific situation) and over the course of their interactions the interlocutor is revealed to be just as troubled, just as off-kilter, as Franz. Perhaps this is not surprising in Berlin of 1928, poised as it was between one disastrous world war and another, teetering on the shaky foundations of the ill-conceived Weimar Republic before falling into the seething cauldron of pride predicated on racial hatred fostered by National Socialism, lost amidst the exhilarating but doomed tumult of creativity, criminality, possibility, and opportunity. 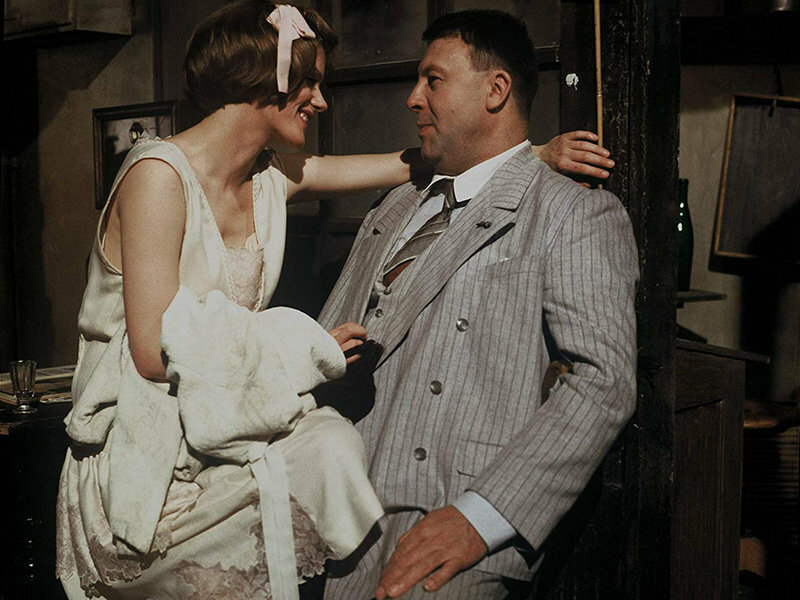 Fassbinder portrays a society caught in a maelstrom of conflicting ideologies and entanglements, lusts and phobias, desires and fears. Fassbinder's vision of Döblin's Berlin is at once squalid and beguiling. Every citizen is imbued with ennui and yet ready to burst into action in furtherance of his or her greed and longing. Every person we meet wears their motives on their sleeves but everyone is on the take. This presents something of a problem for our anti-hero Franz insofar as he takes a solemn oath not to return to his illicit ways. He vows never again to be a criminal and a pimp. The vow is delivered in the crazed manner in which Franz states nearly everything and therefore it's difficult, at first, to know how seriously to take it. For a time, however, Franz seems to take his oath to heart. He attempts to make his living selling fasteners for collars, newspapers, mild pornographic literature, and shoelaces. The latter job inadvertently leads to greater proximity to criminality in that his partner robs a woman on their route and attempts to share the ill-gotten gain with Franz. Meanwhile, Eva (Hanna Schygulla), a prostitute who used to work for Franz, attempts to offer financial and emotional support, and a new and unscrupulous criminal acquaintance, Reinhold (Gottfried John), promotes a scheme whereby he unloads women he no longer wants onto Franz—who repeatedly establishes a relationship with these women and allows them to live with him, only to have to toss them out on some ridiculous pretense when Reinhold tires of his current girlfriend. Not surprisingly for Berlin 1928, Franz simply cannot avoid the tendrils of corruption and he finds himself increasingly entangled in the illicit machinations that somehow both work against the social establishment and prop it up. Eventually, Franz unwittingly (much of what Franz does is unwitting) joins the gang led by Pums (Ivan Desny), to which Reinhold belongs. Franz only intended to let Pums know that one of his men had been arrested but then he is taken along on a heist. During the getaway, Franz insists on his own good nature, rankling Reinhold, who then tosses Franz out of the truck and beneath an oncoming car. Franz survives but loses an arm. Demoralized and claiming he cannot now find honest work, Franz embraces the criminality he had resisted. He returns to being a pimp, running his adoring and adorable new girlfriend Mieze (Barbara Sukowa), enters into a fencing scheme with Willy (Fritz Schediwy), and rejoins Pums's gang. My summary sounds like a fairly standard arching narrative of attempted redemption and the seemingly inevitable fall from grace. And yet, I would be hard-pressed to believe that such a trite contrivance suits either Döblin's innovative novel or Fassbinder's understated and rigorously faithful (at least until the epilogue) film adaptation. The surface narrative arc belies a stultifying sameness that this fictive world occupies—a sameness that captures something of the uncanny experience of tumultuous times. We know in retrospect that Berlin 1928 hovered at the brink of cataclysmic change but Döblin couldn't know that when he wrote the prescient novel in 1929 (over three years prior to Hitler's ascent to power through the 1933 Enabling Act) and Fassbinder endeavors to maintain focus on the immediacy of the moment rather than treat 1928 as a mere adumbration of the catastrophe to come. Hence, the city in Berlin Alexanderplatz nearly exists outside of time altogether; it's a world that cannot persist, owing to its internal contradictions, and yet it endures. It lingers like a bad dream from which you can't wake until finally you become begrudgingly comfortable with the pervasive illogic of it all; you come to accept this unworkable reality as liveable. The repressive uniformity of this corrupt Berlin suits Franz all-too-well. It is indeed the instrument of his torture but, like all denizens of this lost world, Franz has a certain reluctant predilection for torture. And yet, Franz is far from a morose figure. Lamprecht projects an unselfconscious insouciance and a strange assurance amidst the character's endless befuddlement; his chubby face seeming at once boyish and aged beyond its years, unabashedly confident yet eager to please. One of the true pleasures of watching Lamprecht's remarkable performance as Franz is the constant insight into the joys of living a life one cannot possibly deserve. That is what we face with Franz. Even if we ultimately see his tale as one of loss and degradation, the fact remains that Franz is graced with innumerable advantages that he fails to earn or to honor. The most obvious manifestation of his ill-deserved fortune is the inexplicable sway he holds over women. Lamprecht's Franz exudes a strangely alluring charm—despite his obesity and his relatively ordinary, slightly unattractive mien. Over the course of the film, Franz manages to strike up relationships with numerous women of varying social class, varying financial means, and varying strength of character. Nearly every woman with whom he engages devotes herself entirely to his wishes and his well-being. This great fortune, however, hardly prevents Franz from abusive cruelty and violently laying hands upon these loyal lovers. Indeed, Franz's violence against women is a central feature of the film. Fassbinder returns again and again (perhaps too often, perhaps too literally) to the flashback in which Franz murders his prostitute-girlfriend Ida by beating her to death. Each time the scene is replayed it's accompanied by a new narration (delivered by Fassbinder himself)—often the narration involves bits of current news from 1928; in one instance it features a dialogue based on Abraham's attempt to sacrifice Isaac, during which Isaac slowly comes to accept and even desire his sacrifice. It's a horrific scene that does nothing to mitigate the wanton cruelty Franz is willing to visit upon those close to him, those far too weak to defend themselves. One way to read this constant return of the impossible-to-repress is to see it as explanatory of Franz's predicament. On this reading, we are witness to Franz's original sin; the act for which he can never properly atone and therefore the author of all the loss he will experience. But in another, and I think superior, reading, the scene explains nothing; its recurrence even loses dramatic impact through sheer repetition. What remains is the repetition itself, the sameness, the ineluctable fact that in this world nothing really changes. Who is Abraham and who is Isaac in this scenario? Are we to see Franz as Abraham, driven to an act he would rather not commit, unsure of why it's necessary (or even if it is necessary) at all, but bidden to do so by some inscrutable power larger than himself? Are we to believe that Franz simply succumbs to a greater force that directs the path of life toward a necessary point of calamity? This would make Ida Isaac a mere pawn of circumstance, knowing she will die but not knowing why her demise should come now, nor why it should come at the hands of this man upon whom she relied for a time. Or are we to see Franz as Isaac, brought to the brink of eternity, his act of violence forcing open a purview onto the deeply portentous meaninglessness of it all? Is this murder, outlandish and beyond the bounds of necessity, a means of accessing a view beyond good and evil (Nietzsche is invoked later in the series), making the murderer the sacrificial victim in that it is he who is immersed in the punishing relentless world of Berlin 1928? By accepting the mark of Cain, is Franz-as-Isaac the inversion of innocence that suits the callous indifference of Berlin? Does he thereby become the proper sacrificial lamb for a realm of criminality and debasement, insofar as true innocence has no bearing on this world? That would make Ida into a figure for Abraham, both seeing and not seeing the import of what's taking place, recognizing the power that crushes her, finally acquiescing to the blows that extinguish her life, but never truly understanding because the tale of Abraham and Isaac (like Berlin 1928) is beyond understanding insofar as understanding relies on the distinction between good and evil and this tale relies upon the obliteration of any such distinction—to kill is wrong, saith the Lord, and thou must kill. Or is there a third possibility? Perhaps trying to substitute Franz and Ida for Abraham and Isaac (in whichever configuration one finds preferable) is the wrong tack to take. The point of the Abraham story is that Abraham is willing to do what he knows is morally wrong because he's bidden to do so by the figure that establishes and vouchsafes right over wrong. Does the author of morality have the right (is it even a logical possibility) to abrogate the law of morality? And to what purpose? Of course, God relents and offers a substitute for Isaac at the last minute. But the dialogue Fassbinder reads over this iteration of the Ida murder has Isaac not only accepting but willing his own sacrifice. Did the last-minute reprieve come as something of a disappointment for Isaac? Having embraced the notion that his sacrifice was not only required by the deity but that it served some greater purpose, that Isaac's life was somehow more meaningful in relation to eternity than the lives of others, was the denial of that sacrifice experienced as an unrecoverable loss for the child? Was God's reprieve a sign of love or indifference? And how does one return to the quotidian world after this experience? Can one be secure in a world where God might at any moment command the abrogation of the moral law, demand the aberrant abhorrence of a father killing his only son? Abraham makes the lonely leap into faith in all of its absurd contradictions as famously portrayed in Kierkegaard's reading of the tale in Fear and Trembling. But what about Isaac? Abraham leaps alone; he cannot communicate the experience of that leap because it's beyond explanation. What does Isaac learn from all of this? That moment must play over and again in his mind, an endless repetition of the ever-same, without finding purchase in a final outcome. The awful possibility of becoming a sacrifice to the Unknown and Unknowable remains open. Once Abraham embarks on this course of action, what faith can Isaac have in his father, in his world? Abraham, in his leap, gains some purview into the Limitless but Isaac remains forever perched on the threshold of a knowledge that transcends understanding. There's a more mundane consequence of this wrestling with the divine. God, of course, represents the ultimate Oneness of the world. And yet, underlying the very being of the Christian God is the seeming dispersion into the Holy Trinity. God is at once an individual (utterly singular and indivisible) and a plurality (the Father, Son, and Holy Ghost). In this sense, God (the very model for how we understand ourselves within the Christian tradition—insofar as God made humankind in His divine image) is the oxymoronic individual who is not self-identical. God represents the impossible necessity of coincidence with oneself. This non-coincidence of the self is built into our corporeal presence in the world; it's emphatically not the Cartesian split between subject and object (at least not the bodiless subject touted by Descartes). Rather, more in line with the late work of Maurice Merleau-Ponty, we find ourselves caught between two inextricable aspects of the body—the body that senses and the body that is sensible (or open to being sensed); or, as Merleau-Ponty often describes it, the body as the seer and the seen. We see things because we participate in what is visible. But we do not see ourselves as we are seen; there's no getting behind or in front of ourselves in that manner. I am inextricably a part of the world and yet, because I am not for myself merely one object among others in the act of seeing, I also stand apart from the world. At the same, I am in one sense responsible for what is seen of me, I am behind the projections of my body even though I have no actual control over those projections. This behind can be taken in a few senses. I am behind the projection in that the body that I am is the cause of them. I am also behind the projections in that no one projection and not even the aggregate of all possible projections exhausts the I that I am (and again, this does not require the invocation of a bodiless subject—quite the contrary, it is because I am a body that projects that I am inexhaustible). Finally, I am behind my projections in the sense that I lag behind them; my projections are always out in the world ahead of me. I can never properly catch up to them. All of this pertains not simply to the human body, but rather to all bodies. This, as well as the notion of a triune God, imparts a directionality to objectivity that our concept of thingliness too often lacks. Things are not merely objects located in empty space (or in the Sartrean model—set in relief by the negativity of the subject); things are not merely inert, meaningless data awaiting our imputation of meaning to them. Rather, by the mere virtue of the fact that they condition the act of perceiving them, by the fact that their visibility explicitly demands that something or someone see them, things are bound up in a nest of vectors, a series of lines of force emanating from them. Things are dynamic. They don't merely suffer motion; their material element is simply another side to their dynamism. Hence, Franz Biberkopf is neither victim of fate nor master of his own becoming. Franz is one kind of thing, one kind of corporeality, caught up in a world of corporealities acting upon each other, resisting each other's influence, succumbing to each other's blandishments. 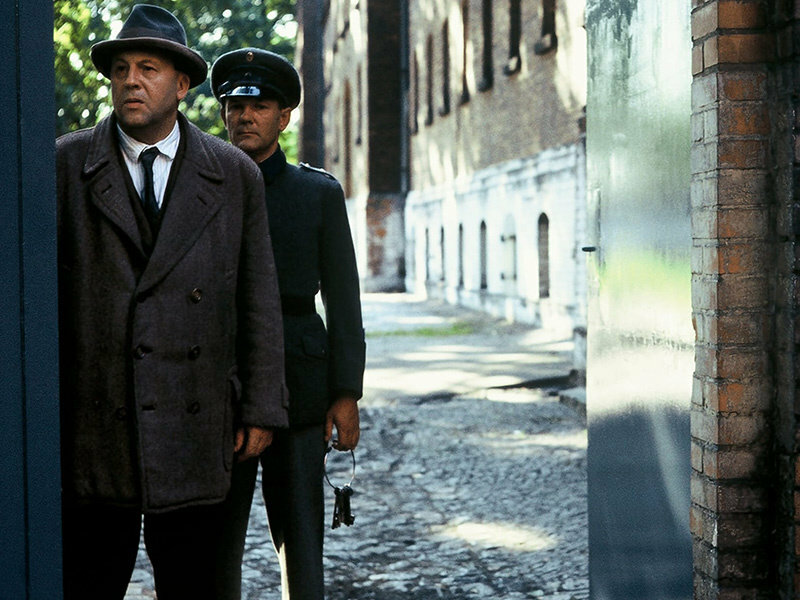 This is what grants Berlin Alexanderplatz its odd relationship to its own plot structure. The narrative arc implies an ascent and reversal effected by some decisive moment of will—this can be read as Franz's will or the will of fate (or the causal force of the political moment, or social caste, or whatever force one wishes to grant agency here). And yet the film's aesthetic, its willingness to allow large swaths of time to go by while we watch Franz having a drink or childishly playing with one of his girlfriends in his apartment—in short, the film's willingness to document the inconsequentialities of Franz's life—suggests that causality here is far more complex and far more troubling. Bodies acting upon bodies. It isn't that Franz was merely dissatisfied in selling collar fasteners and shoelaces, he somehow failed to live up to their material demands, the vectors along which they navigate the world. If everything is simultaneously a flow and a thing flowing—political ideologies, commercial items, people, desires, bottles of alcohol—with its own dynamism, its own directionality, then all things (material and immaterial alike) create patterns of interference, sometimes streaming into the flows of other things, sometimes cutting off those other flows. 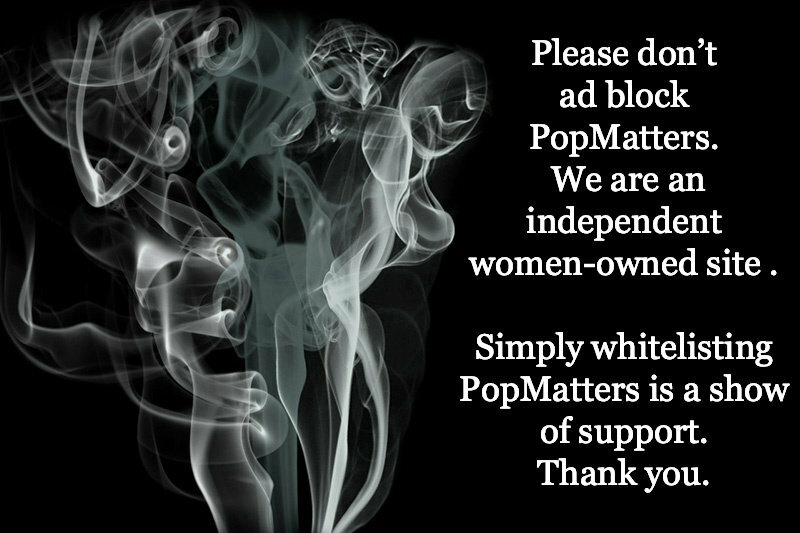 Agency proliferates but it's also mitigated. It's not the case that Franz makes no headway on his own behalf; he is not a mere plaything to fate. But his efficacy is limited by the demands of all around him—including the bottles of alcohol that demand to be consumed, including the items that demand to be sold, including the incident that demanded he lose an arm. If we get frustrated with Franz, it may be because he fails to live up to our more assured belief in a Cartesian subject that operates upon the world at a distance. Franz cannot get away from the world; he cannot contrive a distance from it. He is a body among other bodies, immersed in the world, subject to the interference patterns that emerge from so many differing directionalities. Unlike, say, the titular character in John Singleton's Shaft (2000)—who moves confidently through the crowded streets of 1970s New York City, subordinating other flows to his own, navigating a course of his own choosing and thwarting the flows of others whom he finds objectionable (the ultimate embodiment of the force of will of the bodiless subject, his body becoming a tool of the will)—Franz's path through Berlin 1928 is far more haphazard, far more grounded in the clumsy contours of his body. Even though we repeatedly see Franz in spaces that are purportedly "his"—his apartment, his favorite bar—he never seems to dominate these spaces. He doesn't navigate the world against the tide like Shaft, he drifts in the conflicting currents—sometimes struggling against them (largely without success), sometimes succumbing to their insistence. In this sense, Franz is both Abraham and Isaac at once. Like Abraham, he leaps into a world that remains tantalizingly opaque to him, both embracing and resisting the notion that there might be a place for him there. Knowing he belongs to the world and yet feeling somehow apart, he remains out of synch with the teeming composite of flows that surround him. His agency is predicated upon an enduring lack—an inability to see himself in the scheme of the world; his leap of faith answered by indifference. Like Isaac, he is sacrificed on an altar he fails to recognize; he feels anointed and damned at once. His life appears momentous, full of import, and then is reduced to triviality and the commonplace. He is a part of the world and apart from it. Most importantly, the tale of Abraham and Isaac points to something essential about Fassbinder's take on the Ida murder. The sacrifice never comes off; God relents. Whatever angst and despair Abraham and Isaac built up toward the accomplishment of the sacrifice cannot be properly dissipated, it never eventuated in a fitting conclusion commensurate with the existential strain it placed on father and son. It promised to be the pivotal moment for these two, perhaps was a pivotal moment that altered the directionality of their lives, the understanding of their place in the world, and yet, in the end, it became a non-event. Nothing, ultimately, occurred at all. Franz lives in the age of the non-event, precariously balanced between two cataclysms. The repetition of the murder scene attempts to make that moment into the event of Franz's life, the event that determines the course of his life's flow. Yet the sheer literalness of its repetition, its failure to take on new significance combined with its failure to serve as an anchor for the unfolding of Franz's narrative, prevents the murder from becoming an event in this sense. By insisting on its significance, the murder scene reveals itself to be meaningless. Of course, it's a senseless murder but, more than that, it's also unsuited to bear the weight the film gives it. It necessarily collapses under the strain of attempting to mean more than it possibly can. Hence, the continual effort to find a voice-over narration that will pin down the significance of the murder but that amounts to a constant mismatch between the aural and the visual. The intentional incongruity of the Abraham story as accompaniment to the murder is yet another flow unleashed within the film, its currents streaming along with and against the flow of the murder as non-event. After Franz is hit by the car (the accident that will result in the amputation of his arm), he's driven by the motorists to the hospital. Fassbinder's narration intones: "There is no cause for despair. When I continue with this tale, telling it to its bitter, frightful end, I shall often use these words: 'There is no cause for despair'." If we were to see Franz as the emblem of a bodiless subject, separated from the world by an ontological chasm, acting from a distance, emboldened by the efficacy of an unbound will, there would be plenty of cause for despair. And perhaps Döblin's narration, as read by Fassbinder, might be understood as an ironic understatement of the despair we ought to feel. But I'm more inclined to take Döblin at his word, to believe that indeed there is no cause for despair because Franz does not occupy a privileged space of sovereignty over the world. He is not the avatar for divine individuality that we so often take ourselves to be. Rather, he is a corporeality caught up in the plurality of projections and directional flows in which all corporealities operate. This understanding of the world is not heroic. It doesn't present the world as an obstacle to be overcome, a set of achievements to attain in order to gain victory over an agonistic and intrinsically alien environment. Rather, the worldview presented here is relatively flat. Franz is not outside the world and acting upon it; he is immersed in it, a part of it while standing somewhat apart from it. That is not so much an opposition for him as it is a recognition of different phases of a dynamic motion—like phases of the moon or the trajectory of a projectile. The zenith and nadir of a projectile's path through space are not two separate things, they are moments within a single and continuous flow. Franz the seer and Franz the seen are not separate entities; they are aspects of a body that flows into a world of other flows. Franz is not a hero. Even my earlier use of the term "anti-hero" is not entirely apt. The heroic has no purchase in this world. Franz is on the same level as all other things—no ontological hierarchy, just bodies acting upon bodies. But there's no need for despair. Despair applies to the heroic, to great deeds that ought to have been done but that failed to manifest. This world of flows and the flattening of hierarchies may be bitter, it may be frightful, but there's no cause for despair. 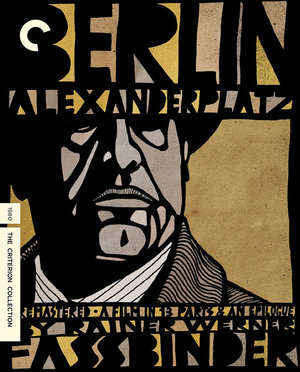 Criterion Collection recently released a blu-ray edition of Fassbinder's extraordinary undertaking, the television film of Berlin Alexanderplatz. Perhaps the most notable achievement here is the quality of the picture itself. The original film, as shown on television and in theaters, was rather dim and difficult to see. 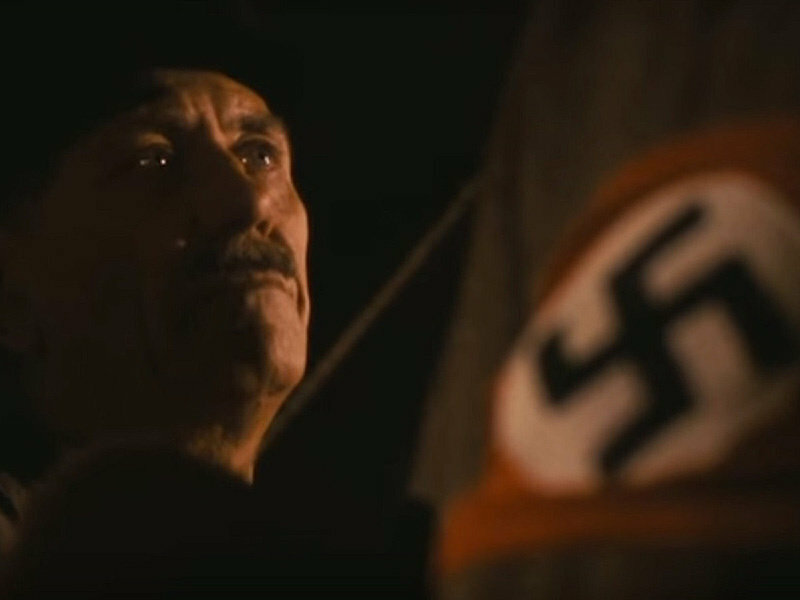 In this refurbished version from 2006, supervised by the director of photography, Zaver Schwarzenberger, the film finally can be seen appropriately. The edition includes several extras such as a 2006 documentary on the restoration, a 2007 documentary on the film featuring interviews with cast and crew, a 1980 documentary on the making of the film, an interview with film scholar Peter Jelavich, and another film adaptation of Döblin's novel by Phil Jutzi from 1931.